Lamine Touré, director of Rambax, comes from a long line of griots, a caste of musicians and oral historians among the Wolof people of Senegal. Born into a family of sabar drummers, Lamine has been drumming and dancing since the age of four. 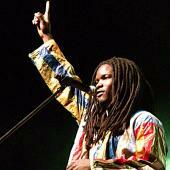 He is one of Senegal’s leading percussionists. Touré launched his career with Mapenda Seck in 1995, followed by a fruitful career from 1997-2001 with Nder et le Setsima Group. As Nder’s percussionist, Touré toured extensively within Senegal and throughout Europe and North America, with performances at Bercy (Paris), the Barbican Center (London), the Festival International de Jazz (Montréal) and Central Park Summerstage (New York). In May 2005, he co-wrote a pioneering composition with Evan Ziporyn entitled Sabar Gong for sabar drums and Balinese gamelan, premiered at the Inauguration of Pres. Hockfield. In 2010, Touré’s excellence in teaching earned him a SHASS Levitan Teaching Prize. Touré is also the founder and leader of Group Saloum, a Boston-based Afropop band that fuses Senegalese mbalax with elements of jazz, funk, reggae and Afrobeat. He teaches sabar drumming and dance classes in the Boston area.